(A) Kaplan–Meier curves for crude and adjusted length of stay in hospital for patients with and without infection with Clostridium difficile. (B) Kaplan–Meier curves for length of stay in hospital for patients with and without infection with C. difficile, accounting for C. difficile as a time-varying covariable. (C) Kaplan–Meier curves for length of stay in hospital for patients with and without infection with C. difficile and “low” (first decile) versus “high” (tenth decile) baseline risk of death, accounting for C. difficile as a time-varying covariable. 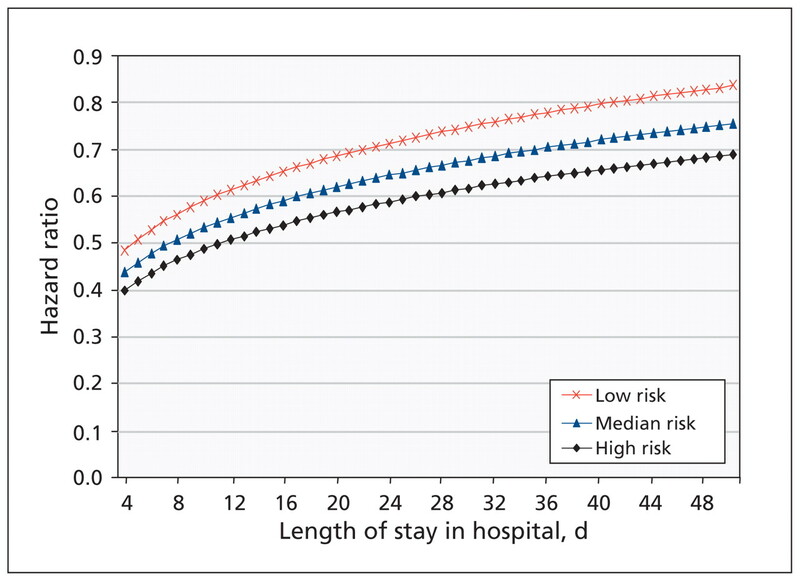 Adjusted hazard ratios for discharge from hospital associated with hospital-acquired infection with Clostridium difficile as a function of time and baseline risk of mortality. Low risk corresponds to the 10th percentile of risk, median risk to the 50th percentile and high risk to the 90th percentile.